After working on something similar for a client several years back (see post here) and getting tons of requests, I finally released the Blog Post Calendar Widget plugin. The monthly grid-view calendar can be added as a widget and highlights both archived and/or future posts. Want to display upcoming events in your sidebar? With the ability to show posts by post type, category, specific taxonomy and/or term, you can opt to display future posts assigned to your event category or event post type. You can download the Blog Post Calendar Widget for WordPress here. This plugin is exactly what I was looking for. To keep it simple, I was hoping to create a Date category and any post in that category should appear on the calendar. Unfortunately it doesn’t work correctly. I am using WordPress 3.5.1. With theme Twenty Eleven. When I hover over a date with a post attached, the post date block expands and the post information appears in that blick instead of in a popup. Really nice plugin! I hope to figure out what is wrong so that I can use it. Can you send me a link to your site? Sorry, I probably should have included that in my original post. 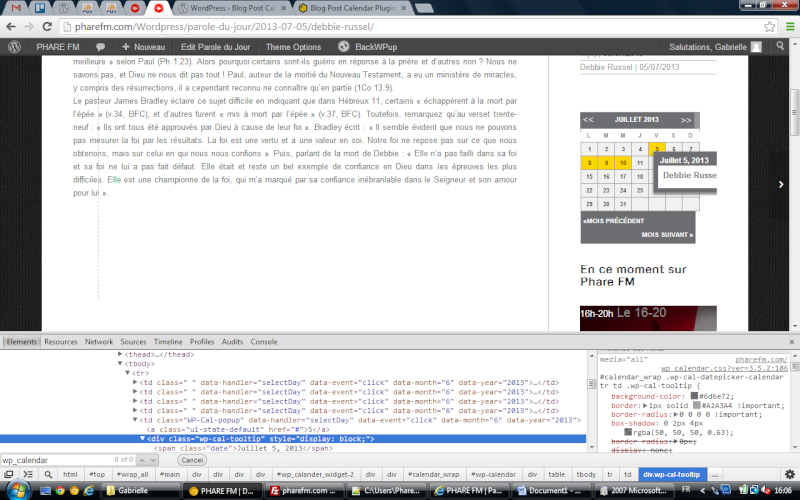 I am still learning WP and messing around with widgets so is it possible that I have made some sort of rookie mistake. So my site is http://dev.altoonaalliance.org/ and I have events set for April 21st and 28th. When you scroll over the dates, the cell expands. If you click on a date, the cell expansion stops until the control is refreshed either by going to a different month or refreshing the page. Again, thanks for sharing your work. I am very excited about the potential of this calendar. What other plugins do you have installed? Did you make any modifications to the Calendar plugin? Try deactivating any other Calendar plugins and also using a fresh copy of my plugin. Hi, very nice plugin, tnx. How can I trnnslate this calendar to another language? And is it posible, to select weekends with some other style? Hey Alex. Are you referring to the headings for the days of the week? Or posts added on weekends? Hello, Ron. Thanks for the answer. I mean to apply to all “su” and “sa” some different style. for example all days (numbers – 1, 2, 3…. ) colored black, but sundays and saturdays colored red; Is it posible? I just added the widget to my dummy site that I run on a virtual server and the calendar is about twice the size (width) of my sidebar. Is the widget supposed to automatically resize depending on the sidebar width and if not, would you be able to add a resizing options to the settings your next update? Thanks. Hey Randy. It’s set to a fixed size at the moment. I’ll work on adding the resize option for the next release. Thanks Ron. From what I can see, it looks like exactly what I was looking for. I’ll keep an eye out for your update. Hi there, I am using your plugin and would like to just direct the date link to an archive for that date (within the chosen category) without the popup. How would I go about that? I’m sure it’s an easy tweak, but I just can’t seem to figure it out. When I click on an event in this month I get a ‘Error 404’. When I go to the next month the calendar only shows an event on the first day, which also gives an ‘undefined’ error. Can you look into this? Tnx in advance. Can you provide me with the URL? Hi, due to a deadline I had to switch to another Calendar widget. But I would really like to know if this problem can be solved. I prefer your widget. I still need the URL…need to be able to replicate the issue. What theme are you using? Plugins installed? Thanks. Hi, this plugin is great, but it really needs to have customisable CSS. I can overwrite the core CSS file of the plugin but this will obviously be overwritten after an update. Is it customisable any other way? Hey Craig. I’ll add it to my to-do list for the next release. Hi Ron, thanks! I’ve got it looking exactly how I want it now, but terrified the client updates the plugin! Also, could do with a class attached to today’s date. Other than that, it’s brilliant. I’ve spent two days trying other event calendars and workarounds but kept coming back to your plugin. Embarrassed. I will update it in the next release. Hi your plugin does exactly what I need for my site but there are a couple of things that don’t work yet. – all language is in english and i’d like it in dutch – can i set this myself somehwere? – the calendar size is slightly to big for my widget area, can i set the size somwhere? 1. Can you provide me with a URL to the install so that I can have a look? 3. I will be working on adjusting the size in my next release of the Calendar. It is a page with a number of events-as-posts, as you can see the calendar only shows one date (May 1st) with an item ‘undefined’. Would you mind emailing me your WP user/pass? I’ll have a look. great Pllugin, thanks! However, I have the same problem as Jeroen: All events in May are not displayed. On May 1, is shown only “undefined”. As of June everything is okay. Can you help please? Hi Ron, sorry for my english (I’m brazilian). I try to use this calendar plugin in a page with Custom Posts and, apparently does not work. What do I have wrong? Thanks for this awesome plugin, I really just wish there was a short code to embed it within a page…maybe in the future? Also if posting future dates, unfortunately someone cant click and read that post as its not published yet…any ways around this? This is a great plugin, thanks for sharing it! In my opinion it has been a while since the default WordPress plugin needs a big update. I need to show the calendar at the main content part of a website, not the sidebar, so I wonder if there’s any way to do it, like a shortcode or similar. I will try to work on adding as shortcode in my next release. thanks for your plugin but I encounter the same problem with the calendar : none of my post appears on it although i have posts on my blog. Hi There, would you be interested in a paid assignment to add post thumbnails to the calendar block. I have a client who had a calendar plugin which did this but the plugin was quite old and no longer works, I haven’t found anything similar anywhere and just don’t have the time to build an entire plugin from scratch to do something like this. Sure. Please feel free to email me the specifics and I’ll get back to you. I sent you a message about a problem with your widget but it seems you didn’t got it. I have the same problem as Jeroen, no events are shown in my calendar. The update has eliminated all the problems! The plugin works great! Thank you! Love the plugin! EXACTLY what I was looking for. Any idea why I would see a spinning/loading wheel when it is placed? Doesn’t ever seem to go away though the calendar is completely functional. Hey Sean. Can you send me a link? Would a screenshot work for you or do you need to look at the framework as well? The project is currently behind a username/password and isn’t live to the public yet. The site is behing a few layers of password/username as it’s currently an active project. Can I send you some screenshots? Can you try deactivating other plugins and also see if it works when using the default WP theme? Would be possible to navigate between years instead of months? same feature request for me! laso there is some ticket on support board of the plugin that need a solution! Hi – love the plugin! Is there any way for the post to show up on the day of the event rather than the day it was published? Great plugin. I have a couple of requests. I would like the plugin to be navigable by year and the second request is instead of showing all the posts, I would like the date to show the number of posts for the day and when I click on the date, it will show me a list of all the posts for that day (which I think that’s how the default calendar works). I have a lot of posts and listing them all is simply not feasible. First of all thank you very much for this plugin, it’s exactly what I needed! I just have a few issues/questions. – The posts appear in calendar only when I’m connected as administrator, and I would like them to be visible for every visitor. Is there an way to change that? It’s possibly due to the theme, I really don’t know, any idea? Hi Awya! I am having the same problem. Did you figure it out how to fix this? If you have the error “Uncaught TypeError: Object [object Object] has no method ‘live'” : wp_calendar.js use the old deprecated jquery live() method, removed from 1.9. You just have to replace it by “on”. Sorry, thats not working. Just downgrade jQuery before 1.9 and pray for a blog post calendar plugin update. Hi Ron!!! Thank you for the great plugin! I installed it but I have a question. The popup of posts on the date goes under the right border of the calendar. What should I do to get it out and to be seen? Is it possible to show highlighted dates not from the date a blog post is published but for the indicated future dates? (as I am going to use it as a future events calendar). If so, what kind of fields and in which files I should change? (I am not a professional developer, but just an amateur :) Thank you!!! Hello Ron, I found your plugin and it is exactly what I need! Could you help me out, and tell me how to fix it please? This is a super widget, it works great. I’v been looking at wp_calander.js. And I think I should alter lines 159 -169. Appricate if you can help me on this. Found the problemm, there was a second display: none; in the stylesheet. First of all thank you for your plugin and the time spend for community. I need for a project to display a calendar with posts, exactly like your plugin can do. But i want the calendar to show post from differents categories. My client has a membership section on his website and a free classic blog section. I need the calendar to display only posts from theses privates categories. I like this widget! It didn’t have a german translation though, so I went ahead and tried my hand at localizing it, which was remarkably easy (added the .js and .mo/.po files, .js by hand and .mo/.po with Codestyling localization plugin). Drop me a note how I should send these files, if you’re interested. The plugin collides pretty badly with the Custom Tables plugin, with the latter overriding the table cell definition with a jQuery UI default, turning all pop-ups into visible content. Seems it’s mostly CustomTables’ fault since that one comes with a rather greedy declaration that affects every “td span” element. I’ve disabled CT, now Blog Post Calendar works as advertised.